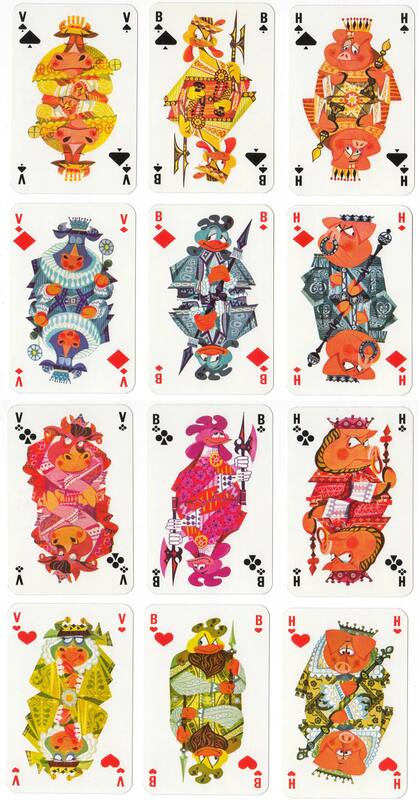 Promotional deck designed by Belgian artist Ray Goossens (1924-1998) for Boerenbond farmers’ union, c.1968. Unfortunately, the cards proved unpopular with regular players because the old familiar faces are replaced by cows, hens and pigs in cartoon form. Above: promotional deck designed by Ray Goossens for Boerenbond farmers’ association, printed by Brepols, c.1968. 52 cards + joker. Autenboer, Dr Eugeen van: The Turnhout Playing Card Industry 1826-1976, Aurelia Books, Brussels 1976, page 79.